Frosty white with shades of red colored natural Orange River Quartz Crystal Points from the Orange River area located in South Africa. Orange River Quartz get their stunning color variations from the inclusions of hematite and other trace minerals found within the crystals. 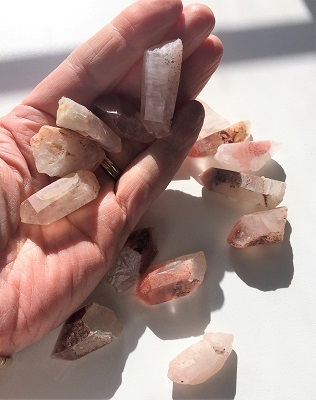 These Orange River Quartz points are excellent crystal tools for providing focus for energy that is grounding, protecting, and harmonizes the mind, body and spirit. Orange River Quartz protects the soul and grounds the physical body during out-of-body journeying. Orange River Quartz attracts love into your life and supports loving relationships. Orange River quartz crystal is helpful in dissolving negativity and protective against negative energies entering the aura. 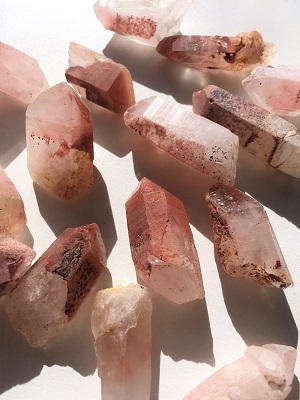 In healing, Orange River Quartz Crystal is an efficient healer as it may help to realign the meridians of the body and encourage energy flow. Orange River Quartz supports the blood, liver and spleen. 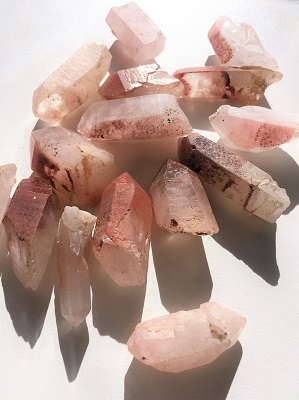 Orange River Quartz Crystal regulates blood flow, increases the strength of red corpuscles, stimulates the immune system, and the reproductive organs.